That is a Rosarito sunset. We got to enjoy this one evening late in the week. I took a seat on a rocky ledge to rest my knee. My son and his friends braved the waves. It was a bit cool that evening, but I would have been right in there with them under different circumstances. I love the incomparable feeling of being moved by the ocean, tasting the salt, being swept of my feet by something so much greater than I am. I love the ocean. It is beautiful. But this moment served only as a capstone to a week in a place that overwhelmed me with beauty, often in unexpected ways. 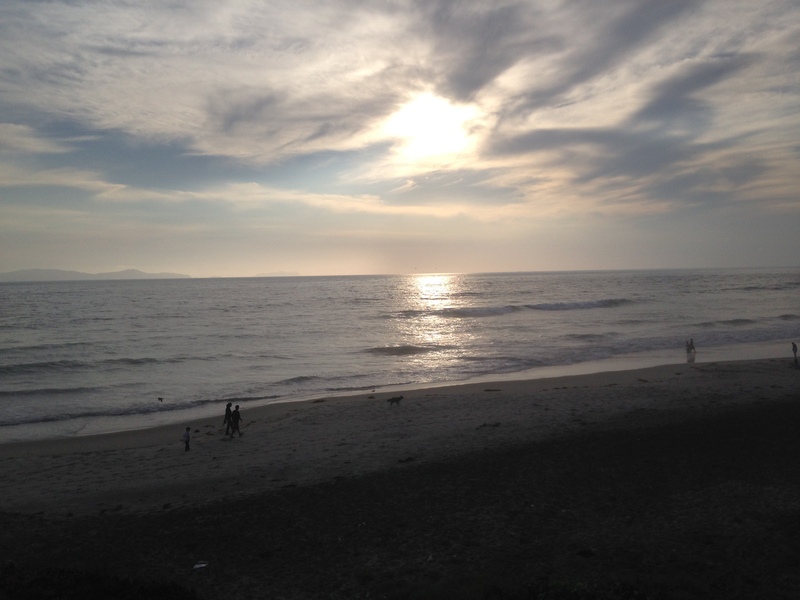 A week serving at Project Mexico begins in southern California. After arriving in San Diego, the work groups meet in Chula Vista, the humble stateside headquarters for PM, and the place where teams are prepared for the trip across the border. “Have your passports with you at all times” “You’ll either get a green or a red light when crossing the border, if green, keep going, if red, expect an inspection of your van.” Its normal stuff when crossing a border, but its undeniable that, to go to Mexico, especially for the first time, carries with it all the baggage of preconceived notions we in the States have of the “border”. We often hear the narrative about crime and drugs in Mexico, of poverty, and of people desperately trying to cross into the U.S. for a ‘better life’. In some circles there is an air of threat when talking about Mexico, namely a fear of people coming from Mexico to the U.S. – an alarmist concern over how ‘they’ are changing our perceived culture. There is certainly a fear of traveling south across the border. I was smacked with the reminder of this attitude on our way back to the States, looking at books in the Las Vegas airport and seeing Ann Coulter’s latest book ‘Adios America’. It made me sick. The xenophobia is evident. I realize Coulter represents the most sensational, purposely provocative of voices (hey, fear sells books, even if it isn’t based in reality or actual expertise). But even in more measured circles Mexico is associated with a narrative of otherness, of problems, of concerns. The truth is, there is an undeniable change that occurs, within a space of less than one mile, traveling from southern California to northern Mexico. This creates a tension that it would be dishonest to deny is present. I heard it in the comments of the teenagers in the back of our van as we approached the border. I resisted the temptation to turn around and offer correction or redirection. Something told me to wait. To let their experience be honest, even with the nervous, sometimes insensitive utterances. They were processing what they saw. I was processing, but being a ‘mature’ adult I didn’t say everything on my mind. Maybe there was a strength in the honesty. Something told me to wait, that any words or platitudes about the poor and rich, of dignity and difference, stereotypes and prejudice would just be preachy. Let them see. Wait and listen to what they say on the way home, that would be the measure. It would be the measure for me too. There is always a danger in ‘charity’ work, especially mission trips, to operate from a place of pity rather than compassion. Pity always keeps the one being ‘helped’ at a distance, it keeps them in the category of the ‘other’. It’s normal to feel pity initially when being faced with the living conditions of people groups quite different from ones own. Pity can light a fire that convicts, that says, “I must re-evaluate the excess and privilege I enjoy in the light of those who have much less.” Pity can be the first , but like the Law, it can only serve as a teacher, a guide, but it cannot save. Compassion (literally, to ‘suffer with’) is where transformation happens, it’s where salvation happens, because it is wrapped up in the Mystery of the Incarnation, the saving work of Christ. Part of that full immersion is to be awake to the beauty, the goodness, the gifts that any person or people group one is serving has and offers. It is to suffer with, but it is also to rejoice with, to break bread with, to play with, to work with, not for. Healing Grace looked like having my heart opened to the beauty of Mexico almost immediately, overwhelmingly. This beauty was not just in the terrain, the sunset, the ocean, all of which can be enjoyed as a tourist. It was beauty in the ordinary. It was getting the sense of being a guest in someone’s home, in someone’s community – a home and a community that exists and operates quite well even with much less material wealth. The Project Mexico team does a great job of preparing volunteers to come with an attitude of being a guest, of showing respect and honoring the sacred space we were entering into when stepping foot into a neighborhood, or even onto the orphanage grounds. “Remember this is someone’s home.” That opened up some kind of door in my heart to let beauty just rush in. I concentrated on details in Mexico in a way I haven’t for a long time. I just took it in. I loved being there, the sounds, the air, the smells, the language, the way people engaged one another. I have more to say on this, but for today I’ll end with a picture of one of the most beautiful altars I’ve ever served at. 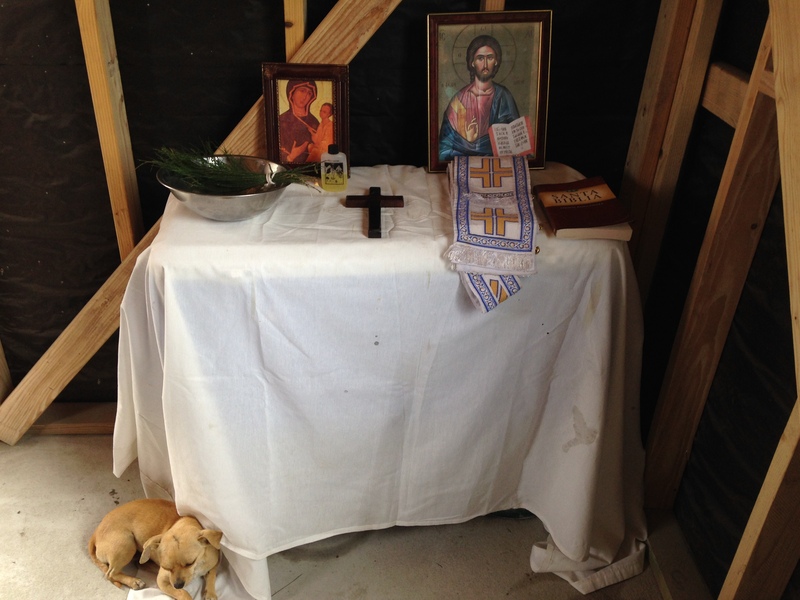 At the end of building a house, we do a house blessing. This is something we do in the Orthodox tradition as a way of saying “amen” to the sanctified space, and offering prayers of blessing on the home and the family. We put this altar together with a couple of coolers and a sheet. Its perfect. Its beautiful. And oh yeah, there’s that dog I mentioned before. He’s beautiful too. I’ll get around to telling you his story next time. Thank you for sharing Padre – it helps tremendously to read these reflections! Beauty and Grace, Love and Mercy…much needed these days.